Or over $250 in donated local prizes? 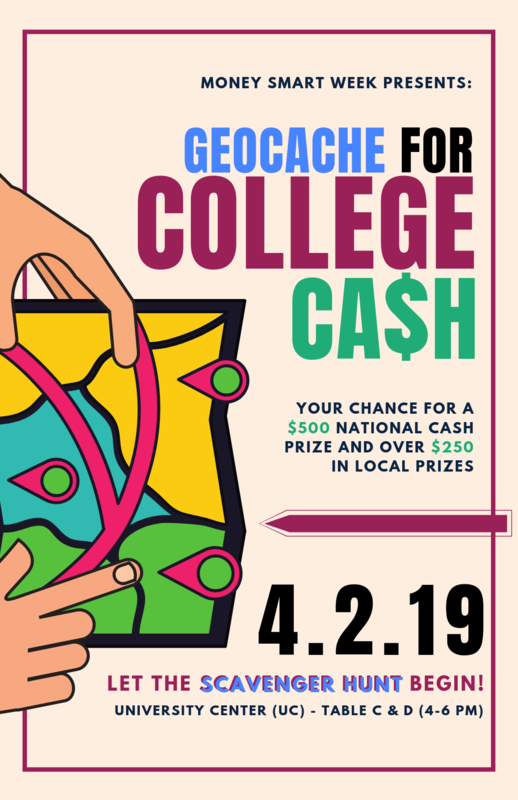 Money Smart Week’s headliner event is today: GeoCache for College Cash! You’ve probably heard of Geocaching — using an app on your phone to do a mobile scavenger hunt and find small prizes or “caches”. Well, here, the “cache” is a poster with some information that’ll help make you Money Smart — and maybe introduce you to some helpful resources you didn’t even know existed. The big event (with the most prize eligibility) is TODAY, April 2, at 4-6:00 starting in the UC commons area. Be there! If you missed the event, visit the Andersen Library’s main floor area — the posters will be on display for at least another week, you still can play and be entered to win some of our major prizes! 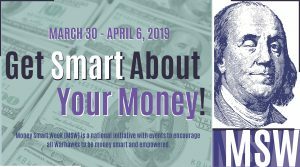 And check out the rest of our Money Smart Week events too! In your own kitchen for the first time, and needing inspiration? Struggling to make healthy dining choices that don’t blow up your budget? We can help! 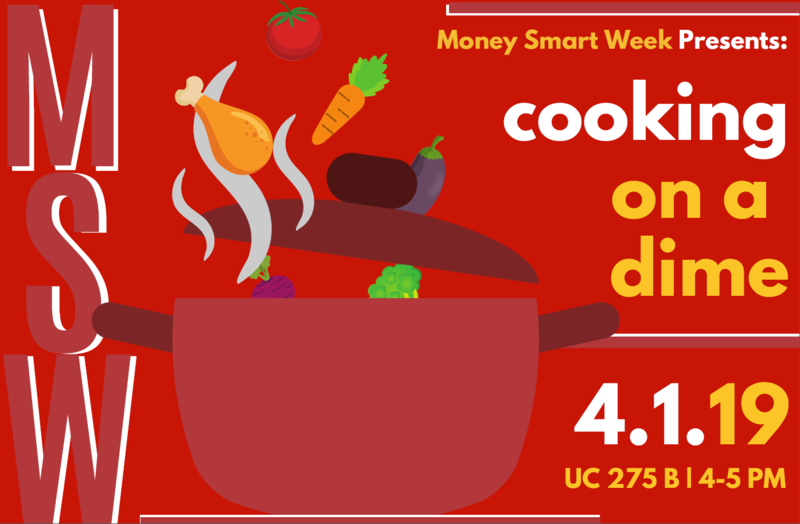 Money Smart Week kicks off today with Cooking on a Dime — recipe demonstrations, food giveaways, cookbook giveaways, and education to help with whatever your food quandary may be! It’s TODAY, April 1, at 4:00 in the UC room 275B. Be there! If you missed the event but are still interested in learning something yourself, check out some great free resources: Good and Cheap is a free, beautiful, online cookbook meant to help you prepare good and healthy food on just $4 a day (wow!) Budget Bytes is another great site I’ve used (she also has a cookbook and downloadable app) — it’s incredibly searchable, plus this great index by ingredient lets you find a use for that odd vegetable you got at the farmer’s market last weekend. Prepare to vote on April 2nd! Tuesday, April 2, 2019 is election day! Are you prepared? Voting in Wisconsin? Visit MyVote Wisconsin to check your voter registration status, find your voting place, and to learn what’s on your ballot. There’s a statewide election for a Wisconsin Supreme Court justice, for which Brian Hagedorn and Lisa Neubauer are running. You can see other elections in Wisconsin, including three Court of Appeal judges (Districts 2, 3, and 4), online via Ballotpedia. Some ballots will include votes on circuit court judges, school board members, municipal offices, or referenda. In Whitewater, there are city Council seats up for election, a Whitewater municipal judge position (for which Patrick E. Taylor and Chad Buehler are running), and two Unified School District seats to fill (for which Jennifer E. Kienbaum, Jim Stewart, and Amy Hagen Curtis are running). Recordings of the local League of Women Voters’ candidate forums for the school board and council candidates may be viewed online. More information about voting in Wisconsin, e.g., eligibility and ID requirements, may be found at Vote411.org. Information about voting in Whitewater is provided online by the City Clerk. If you’d like assistance with finding information about voting in other locations, please ask a librarian (email, chat, phone 262.472.1032, or visit the Reference Desk)! Perhaps it’s unkind to remind you of ice and cold when spring is finally in the air. But if you think we’ve had a miserable winter this year, you can console yourself with the thought that it was probably pretty mild compared to the Little Ice Age of the Seventeenth Century. The long and bitter winters had a profound effect on Europe and other parts of the world. The beastly cold precipitated a shift from rural areas to the growing urban centers where peasants could find work — and food. Upheaval seemed to be everywhere during this time: the effects of the Protestant Reformation were still reverberating through much of Europe and capitalism was on the rise. A spectacular comet in 1680 had everyone talking — and speculating about what it might mean — an omen of divine judgment? (pp. 185ff). 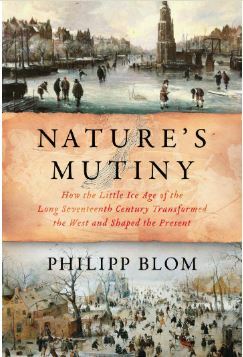 The author credits the Little Ice Age with bringing about the societal shifts that would eventually become the Enlightenment (p. 23). Perhaps something equally interesting lies in store for us? Andersen Library has other books on the Little Ice Age, too. So curl up in a warm, sunny spot and learn all about the frigid Seventeenth Century. 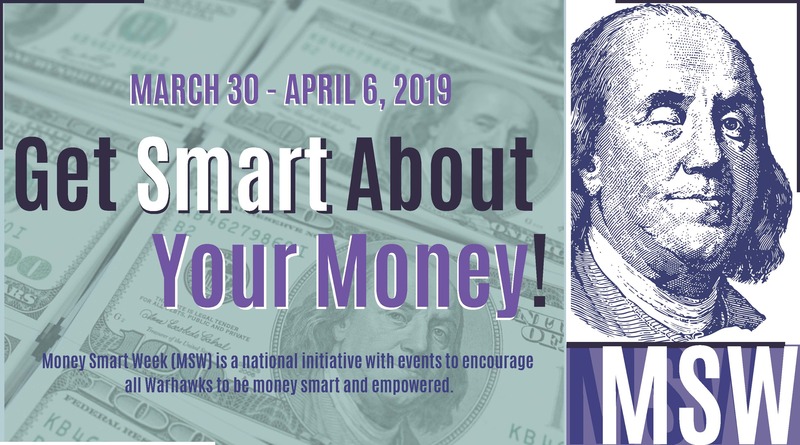 Money Smart Week 2019 is coming! I know, nothing’s on your mind right now but getting through midterms and getting to spring break…. Adulting 101 — answer a quick question and get a candy prize. Easy! Monday April 1 and Tuesday April 2, UC commons, 10-2:00. Cooking on a Dime — everyone likes to eat, right? Free samples and cookbook giveaways! UC 275B, Monday, April 1, 4:00. GeoCache for College Cash — everyone likes prizes, right? Over $250 in local prizes and your chance for one $500 national prize! UC commons, Tuesday, April 2, 4-6:00. Financial Crimes Awareness & Prevention — nobody likes identity theft, right? Booo… Come and learn to protect yourself. UC 264, Wednesday, April 3, 2-3:00. Homebuying 101 — whether it’s a someday-dream right now or an actual possibility, come and learn in this no-pressure presentation. UC 262, Thursday, April 4, 3-4:00. Paint-a-bank — witness the cuteness from last year. You know you want one too. Andersen Library, Thursday, April 4, 3-5:00. See the full schedule of events in a poster here. Now, go have a fun break! Posted in campus connection, money mondays, uncategorized	| Comments Off on Money Smart Week 2019 is coming! The Andersen Library has been busy with events, their most recent was a masterpiece. Partnering with Pathway for Success, the event had a total of 25 young artists attend. Thank you to all who made it out to the event, and if you missed it, don’t worry, there will be another Rest Stop event in the fall semester. We hope to see all our young artists out again. Check out a few photos from the hit event. New Study Pods to Come to Andersen Quiet Study Floors? Andersen Library recently brought up the idea of rearranging the furniture on the quiet study floors (First and Third). There is a ‘Try-It’ station featuring one of the pods on the second floor of the library, students and guests can test, leave their thoughts, and even take a piece of candy for their participation. The pod will be out on the second floor for a few more weeks, just in time for those midterm study sessions! Stop by today and see how you feel about the possibility of the new study pods coming to Andersen Library. Posted in around the library, education, featured resource	| Tagged andersenlibrary, QuietStudy, StudyPods	| Comments Off on New Study Pods to Come to Andersen Quiet Study Floors? With the famously sodden holiday of St. Patrick’s day a-comin’ — not to mention Whitewater’s own upcoming Spring Fling — how could I not take a second look at this title? 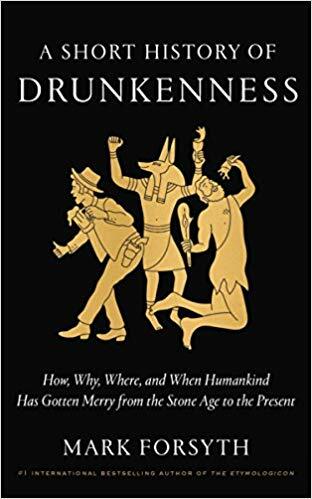 If nothing else, just to enjoy the delightful assortment of euphemisms (British, because of course Brits would have lots of euphemisms, and otherwise) employed for alcohol and getting drunk. Maybe America’s silliest law, Prohibition, wasn’t really such a failure after all. Where does one source such a history, one asks? Alcohol shows up surprisingly often in written records about celebrations, rituals, government procedure, etc. But for some of the earliest civilizations, Forsyth draws from origin stories, carvings or paintings, archaeological evidence, or sometimes the aphorisms or laws passed down through generations (as he points out, you only need to make a law or a pietistic decree against something if a lot of your comrades are already doing it.) This book is a rollicking, wide-ranging, and fun historical tour! 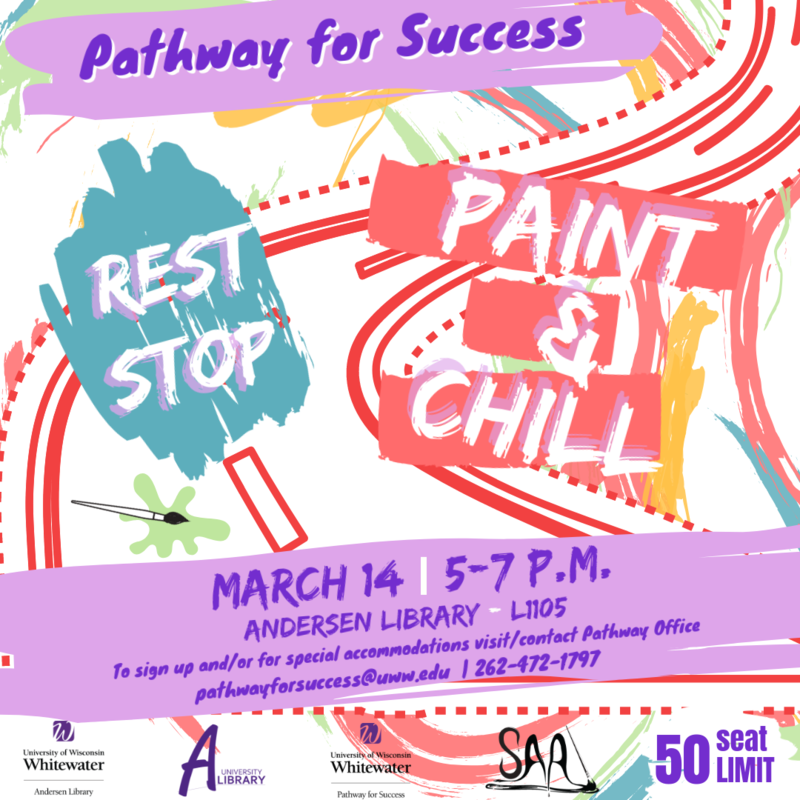 On March 14th, the Andersen Library will host Pathway for Success’ Rest Stop, back again after record breaking attendance last year! Rest Stop is an event that helps students unwind before midterms by giving them an opportunity to be creative. This year will expand on seating and activities with button making and a popcorn machine. As always, students, all stages of education, are welcome with last year’s attendance easily breaking past 50 students. There will be information stations from Andersen, Winther Counseling Lab, and University Health& Counseling Services. Interested? Check out our other activities and events on our events page or follow us on social media.